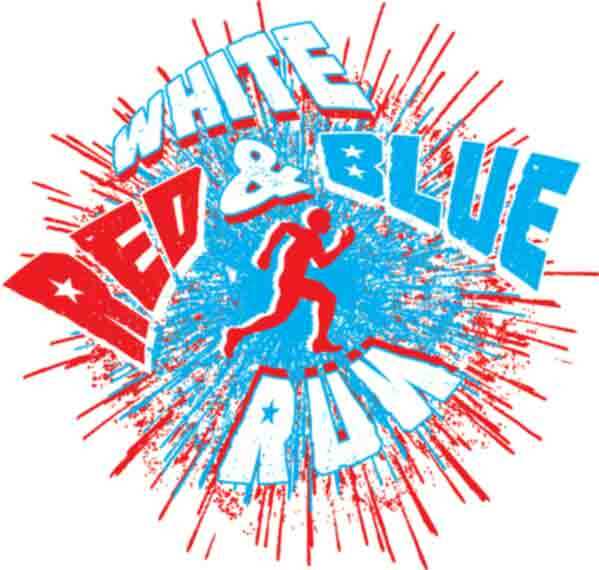 Register today for the Rio Rancho Red White and Blue Run: 10K, 4-Miler and Kids K. This 4th of July event is a great way to start your 4th of July celebrations. Whether you are running solo or the mixed couples Red White and Blue 4-Miler or 10K Team division, this one is for you. So lace up your running shoes and register now. Hurry! Register now to receive a tie-dye, red, white and blue RunFit tank top while supplies last! PLEASE NOTE:THERE IS RACE-DAY REGISTRATION; HOWEVER, ALL PRE- REGISTERED PARTICIPANTS MUST PICKUP THEIR EVENT PACKETS AT "PACKET PICK-UP." Ifyou are not able to pick up your packets in person at the above location and times, you must make arrangements for a representative to pick up your packet. Any out of town participants may pick up their packet on race morning at the registration area located inside the Rio Rancho Aquatic Center. The Start for all events: 10k and 4-Miler is located next to the Rio Rancho Aquatic Center and Loma Colorado Park. Note: The Kids K Start and Finish is located at the Loma Colorado Park. Note:Race Day Registration and Timing Chip Pickup will be located at the Rio Rancho Aquatic Center. NOTE: ALL PARTICIPANTS IN THE 10K AND 4-MILE WHO WOULD LIKE TO BE ENTERED IN THE RESULTS AND BE ELIGIBLE FOR AWARDS MUST WEAR A TIMING CHIP/BIB. ALL BIBS/TIMING CHIP MUST BE WORN ON THE FRONT OF THE PERSON AND BE VISIBLE AT ALL TIMES. Allraces will start promptly at the designated times listed above. Allow plenty of time to get to the Start Line in order to seed yourself according to your projected pace time. If you are driving to the race plan to arrive early. See parking information below. Thisrace is a Gun Start with a Timing Chip finish. The "official time" will start when the gun/horn goes off. NOTE: ALL RACES WILL START ON TIME SO PLEASE BE AT THE START 10-15 MINUTES PRIOR TO THE START. NOTE: Please do not enter Road/Start area prior to signal from race director. Please wait on the sidewalk and area next to start. This applies to 10K and 4-Miler Run or Walk. PLEASEUSEDESIGNATEDPARKINGAREASONLY.DONOTPARKONROADS – INCLUDING LOMA COLORADO BLVD. AND BIKE/PEDESTRIAN PATHS.AVAILABLE PARKINGATRIO RANCHO AQUATIC CENTER,RIO RANCHOLIBRARY AND LOMO COLORADO PARK. Each participant will receive a Race (Bib) number that must be worn on race day. DO NOT alter your race number in any way. Your bib number must be visible and worn on the front -- outside of all clothing -- during the entire race so that it may be clearly seen. Bib numbers are nontransferable and MUST be worn by the runner to whom it is assigned. Yes. USATF, the national governing body of the sport, amended its ban on headphones, iPods and similar devices. Yes, participants may wear their Garmin GPS watches and/or Nike Plus devices. However, these items do not count as "second timing devices" and will not be recognized by the event as official times or distances. The use of video devices, cell phones, computers, cameras or any similar devices by participants in the event is prohibited. The use of wheeled devices by participants or any other person authorized to be on the course shall be strictly limited to: (a) authorized and registered competitive wheelchair participants; and (b) authorized course marshals on bicycles. Skateboards, rollerblades, unauthorized bicycles or any other wheeled device will not be permitted. Are baby joggers and strollers allowed? If you choose to run with a baby jogger, you must seed yourself behind all other runners and you must register your child through the pusher’s original registration, at no charge, for a Rider Bib. Baby joggers and strollers are not allowed in the 10K event. It is your responsibility to make sure your baby jogger or stroller does not impede other runners, and you must take extra precaution to ensure your safety, your child’s safety, and the safety of the runners around you. We reserve the right to pull any participant from the race who is endangering other runners or themselves. Note: Your child must be secured in jogger or stroller at all times. Do you have a Lost and Found in case I lose something at the Event or on the race course? Yes. We will have a Lost & Found for items that were lost and found on race day. If you are missing a personal item, please call: 505.217.4774. Yes! Dogs are allowed at the event so long as they are non-aggressive and well behaved, on a 6’ non-retractable style leash, and the owner must be in possession of materials to clean up after their pet. Note: No dogs permitted inside the Rio Rancho Aquatic Center. We reserve the right to pull any participant from the race who is endangering other runners or themselves. Weather forecasts will be monitored prior to the event paying special attention to the possibility of heavy rain, thunder and lightning, high winds and extreme temperatures. If necessary, athletes will be made aware of these predictions on the RunFit website: www.irunfit.org so that participants can properly prepare for severe weather during the race as well as possible course alterations. Severe weather updates will also be sent to participants via email as necessary. The Race Director will monitor the weather and make a decision if any action will be taken to modify the race. Possible changes include: altering the start time for the race or in extreme situations, cancellation of the event. Please listen closely to all public address announcements at the starting line of the race. Visible lightning will cause the race to be postponed for a minimum of 15 minutes. Additional sightings will continue to delay the race in 15 minute increments. If extreme heat is predicted, extra water will be provided to the athletes, both prior to, during and after the event. The medical team will be alerted that athletes may require additional medical attention during and after the event due to the high temperatures. Medicalstaff members will be ready to assist you at any time. Radio communications personnel will be positioned at every aid/water station along the course. The event officials have the right to withdraw any runner from the race that appears in distress or atrisk.Ifyouhavea health or medical problem at the Finish Line, you will be directed to the MedicalArea. R.R.AquaticCenter.Pleasecooperateifyouare asked to go for a checkup. If you feel that youneed help at any point, please ask for it! Ifyou are unable to finish the race for any reason, please notify a race official of your bib number so that the medical personnel are aware. The overall and division award winners will be announced at the Awards Ceremony on race day immediately following each event. Overallprizes will be awarded to the top three men and women determined by gun time. Age group prizes will be given to the top three finishers in the following categories for men and women: 15 and under, 16-19, 20-24, 25-29, 30-34, 35-39, 40-44, 45-49, 50-54, 55-59, 60-64, 65-69, 70+. 60-64, 65-69, 70-79, 80+. Award times will be determined by gun time. Allregistered participants (12 and under) are eligible to participate in the RunFit Kids K. The start of the RunFit Kids K will begin at 9:30 in the Loma Colorado Park next to the Rio Rancho Aquatic Center. All participants will receive a special recognition award at the finish. Post-Racerefreshments will be held at the park. Results from the 10K and 4-Miler events will be posted on the RunFit website: www.irunfit.org. See course links below and decide where your family and friends can cheer you on when you most need the support.